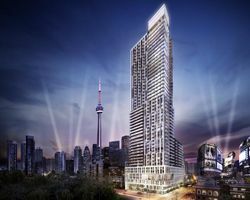 Blending style and sophistication with urban panache within a garden-like sanctuary, Dundas Square Gardens condominiums brings affordable luxury living to one of downtown Toronto’s most exciting emerging neighbourhoods. Dundas Square Gardens is developed by the Easton’s Group, one of Canada’s most respected developers, and features inspired architectural design by Page+Steele Architects. Commanding the corner of Dundas Street East at Jarvis Street, the project features Dundas Square Tower, a soaring 47 storey tower on the site’s western half, and the unique Garden Tower, a 16 storey tower featuring five impressive and expansive rooftop gardens and terraces exceeding 16,000 square feet, or more than one-third of an acre of green space in the heart of the city. Features and finishes include quartz kitchen counters, stainless steel appliances, porcelain bathroom floors and shower/tub surrounds, custom-designed vanities, sleek and modern plumbing fixtures and laminate flooring, adding to the modern and contemporary design with 8.5 ft. ceilings in each suite. The Garden Tower will offer its residents the best of both worlds – a shorter boutique building with separate entrance and elevators, but offering residents access to the full range of amenities that include a fully equipped Fitness Centre and Yoga Room, outdoor pool with an infinity edge adjacent to the lounge and bar area, barbeque area, water feature, hot tub and secluded seating areas. On the 2nd floor residents will find a library with study spaces, meeting spaces and guest suites. Many of the units in the Garden Tower will have exclusive use of large, oversized terraces, which become extensions of their own private living space. The terraces are perhaps the most stunning architectural statement of Dundas Square Gardens and without parallel in downtown Toronto. Residents can enjoy such outdoor living options of hanging out at a BBQ pool party on the 18th floor terrace, relaxing on the 5th floor terrace while reading a good book, or hosting a party on the 3rd floor Garden Terrace, adjacent to the two storey Sky Lobby. The spectacular Sky Lobby will feature a grand lobby, amenity lounge and party rooms, and a screening room with support spaces. The modern features and dramatic lighting elements will make the Sky Lobby a focal point of the entire project. Dundas Square Tower is articulated by a shifting white grid that wraps the façade. Balcony stacks interrupt the grid at key corners. The result is a dynamic changing façade that appears different from every vantage point within its urban context. This lantern element will become a beacon for the project, making it visible from great distances and indeed a significant statement within its neighbourhood. Dundas Square Gardens is centrally located close to transit and with the shops and excitement of Yonge and Dundas Square and the Eaton Centre just steps to its west, Alan Gardens to its southeast, and within easy walking distance to Ryerson University. As part of its commitment to the area, Easton’s Group will donate $1,000 to Ryerson University for every suite sold, topping out this impressive donation at $1 million. Dundas Square Gardens will be a signature statement of unique architecture and environmental excellence within downtown Toronto. A rare blend of contemporary design, luxury finishes and amenities that perfectly captures the lifestyle of today’s modern urban living. The limited University Collection Event going on now features builder incentives including two free years of maintenance fees, two years of free property management, and a two year leaseback program. Available suites range from 501 sq ft to 773 sq ft, and are starting at $309,998. Parking is an extra $55,000 (available to all suites for a limited time), and storage lockers are $5,000.